Young viewers watching Arthur on New Mexico PBS in late March may not have noticed anything unusual about their favorite animated aardvark on TV. Behind the scenes, though, the show was delivered to Albuquerque in the first on-air test of PBS’ new sIX interconnection system. Designed to move some content from expensive satellite transponders to a terrestrial fiber-based system, sIX will be cheaper and more versatile, proponents say. After years of planning and discussion, the real-world arrival of sIX has begun. With completion of a second test this spring at KSPS in Spokane, Wash., PBS will deploy teams to 120 other PBS member stations and joint master controls around the country. Teams of vendors supporting sIX will be working with stations on a tight schedule to complete installations by September. 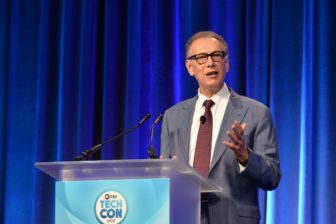 Vecchi speaks at PBS TechCon April 4. The timeline is designed to allow PBS to relinquish one of the three satellite transponders it now leases from SES, says PBS CTO Mario Vecchi. Two of those transponders on SES’s AMC-21 satellite are used for traditional linear programming distribution. The third has been used for “file-based transfer,” the role that the sIX fiber-based system will soon fulfill. “It’s not a trivial effort,” said Tom Crowe, PBS VP of interconnection and distribution technologies. That’s one reason why sIX is depending on several private partners to achieve its tight schedule goals. CenturyLink, one of several nationwide providers of fiber interconnection, is providing the actual fiber links that will connect PBS’s master control in Virginia to each individual receiving location around the country. The connection isn’t that much faster than a home broadband connection these days — 100 megabit-per-second Ethernet, with the potential to speed up to 1 gigabit-per-second — but content won’t travel over the public internet. It will be much more secure, with higher reliability than the public internet can provide. “It’s not the exciting part of the system,” admitted Marti Kiser, CenturyLink senior account director. It is, however, a part of sIX that will be under intense deadline pressure, which is why she called on TechCon attendees to be prepared when the sIX team contacts them with an installation date. The good news, at least for CenturyLink’s installation crews, is that they don’t have as many sites to install as PBS had originally expected. When development of the sIX system began, PBS planned to connect fiber to 170 station sites. But the rise of joint master controls has reduced that total to about 120 sites. The consolidation allows sIX to serve multiple stations connected to each joint master control with just a single fiber drop. Adoption of joint master controls has not disrupted planning and development of sIX, Vecchi said. “We all understand it, the vendors understand it, and it’s basically baked into the way we’re going through the rollout,” he said. Additional vendors supporting sIX were also at TechCon to demonstrate the system to station representatives. Vigor Systems Inc., whose PitchBlue content delivery platform has become a standard in commercial television, customized the system for use in sIX. Myers, which claims a reach of 98 percent of PBS member stations with its ProTrack broadcast management system, is handling the traffic and content management for sIX. The goal, representatives of the vendors say, is to provide stations with more flexibility in how they receive content. Under the existing satellite-based file-transfer system, files are generally available for only 10 days, Crowe said. On sIX, stations can access them indefinitely via a cloud library that’s available 24/7. As PBS interconnection continues its march from linear video delivery toward a more file-based approach, its engineers and technologists are working with Vigor, Myers and local stations to try to bring some sanity to the welter of conflicting standards for file formats and metadata. “We recognized that we need to provide stations with the formats they need,” Crowe said. Working from the previous system, known as the Next Generation Interconnection System, his team came up with 93 distinct profiles for stations’ preferred file delivery formats. The number of profiles has been winnowed down to 75 with the cooperation of stations, but Vecchi says it needs to become much simpler in the long run. “Ideally you may want to have just a handful, maybe five or 10, but that’s a work in progress,” he said. The more standardization stations can provide in their infrastructure, the more easily PBS can solve their problems as sIX goes into effect. Better standardization will also help during the next phases of sIX build-out, which promise to allow stations to upload their own content to share with others in the system. Meanwhile, as the sIX team works through the spring and summer to put groups of 25 new stations online every few weeks, Vecchi said they’ve learned to expect surprises. “We did a lot of testing and looked at all the possible scenarios about how everything needs to work,” he said. “And yet when we went to do the first rollout with the first alpha station, there were hiccups, though nothing that was a showstopper by any means.” At New Mexico PBS, he says, the hiccups involved confirming that files had successfully moved into the station’s own servers from the sIX fiber delivery system. To help stations prepare for their transition to sIX, TechCon offered several panel discussions and also hands-on training. In a meeting room, hardware was set up with a live connection to the sIX interconnect, allowing station personnel to learn the interface. Representatives from PBS, Vigor, Myers and CenturyLink were on hand to answer questions. If the schedule holds and the file-transfer satellite transponder is switched off in September, PBS will begin moving its linear content over to fiber distribution, Vecchi said. His goal is to eliminate the costs of one or both of the two remaining satellite transponders. Tests have already demonstrated that the sIX fiber-based infrastructure can easily be extended to carry linear video as well as files, Vecchi said. “It’s just a matter of how quickly we can move and get there,” he said. The target date for that next set of changes is 2021, according to Vecchi. That’s when the CPB grant for the first phase of the sIX project runs out; it also coincides with expiration of the last of PBS’s current satellite contracts. Starting in calendar year 2019, Vecchi said, PBS will seek funding and set requirements for phase two of the project, likely moving completely to terrestrial distribution. At last month’s Public Radio Engineering Conference, held around the corner from TechCon, station engineers grilled representatives of the Public Radio Satellite System about their transition to a new generation of receivers. Stations have complained since 2012 about the current receivers, International Datacasting’s SFX4104, in part because they lack some of the flexibility PRSS had promised to stations prior to launch. PRSS leaders said they’re listening to those complaints, with the help of a technical advisory group of local station representatives. PRSS established the group after last year’s PREC yielded a long list of concerns. Bruce Wahl, NPR VP of distribution, told PREC attendees that PRSS is now in the “closing stages” of selecting a vendor for its next generation of receivers. As with PBS, that next-generation system is being designed to include a terrestrial component in addition to satellite delivery. At minimum it will include an internet-based return path from stations, according to Wahl and NPR Broadcast Systems Engineer Jon Cyphers. It may even move most of its main delivery path from satellite to terrestrial distribution. During the last PRSS upgrade, each public radio site received two receivers for free; this time each will receive two receivers and have the option to buy more. The need for additional receivers may be reduced, however, by PRSS’ response to complaints about the limited number of output ports on the current receivers. Specifications for the new receivers call for a greater number of output ports that can be configured more flexibly to meet station needs. PRSS is in the midst of another big change to its satellite delivery system. Like PBS, it hopes to reduce the number of satellite transponders it occupies. Instead of separate transponders carrying live linear audio and file-based traffic, PRSS recently turned on a “combined carrier” that delivers both linear and file-based content over a single transponder. After stations transition to that new system, PRSS plans to turn off its legacy linear-audio carrier no later than 2019.